If you are interested in the relationships between Maps, Art and Time (and if you speak French…) this might be a great event to attend: Colloque “Temps, art & cartographie: La sémiologie dans tous les sens”. This colloquy will take at the University of Strasbourg (France) on March 16–18, 2016. Deadline for submitting abstracts: October 31, 2015. This month, our Map of the Month section features the back in time feature on the website Géoportail by IGN France. It received the third jury prize in the category “digital products” at the International Cartographic Exhibition at ICC 2013 in Dresden. 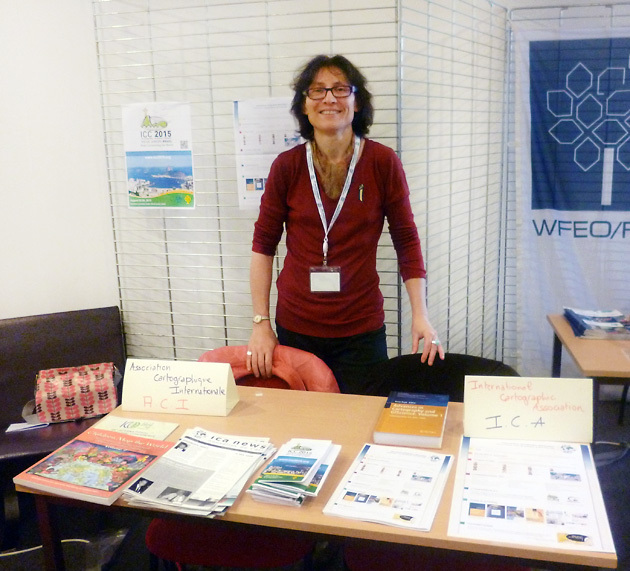 The ICA was present during the 37th session of the General Conference of UNESCO, November 2013, Paris. Anne Ruas run a booth and gave a talk to present the activities of our association during the Non Governmental Organizations event. The role of map and geographical information for development and education was particularly emphasized. Having a better, quicker description of our world, its resources, its events, is a major importance. 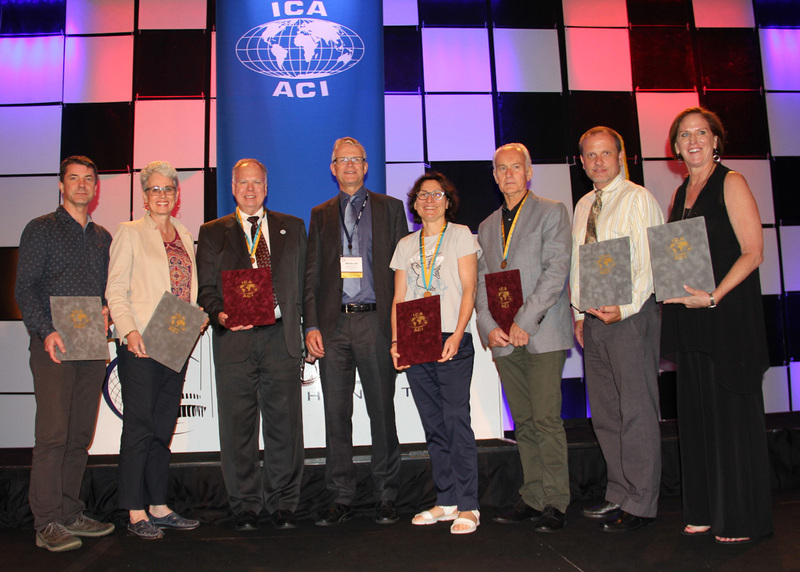 The ICA is a leading international organization that plays an important role to improve the expertise and processes to make the information more readable and more accessible for all. Different contacts were taken with other organizations from Mali or Kenya such as SIL International which deals with the studies of minority languages and cultures around the world. 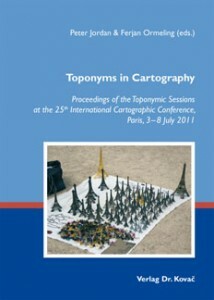 The proceedings of the toponymic sessions at the 25th International Cartographic Conference, Paris, 3–8 July 2011 are now published in the book Toponyms in Cartography, edited by Peter Jordan & Ferjan Ormeling. 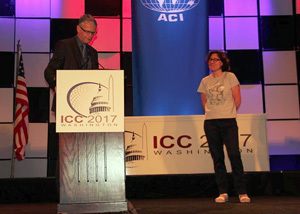 The ICA’s 25th International Cartographic Conference in Paris in July 2011 is special from a toponymical point of view because it marks the first meeting of the joint ICA-IGU Commission on Toponymy. Toponymy has been a regular theme for international cartographic conferences for decades, and it is only proper that this has been institutionalized now. 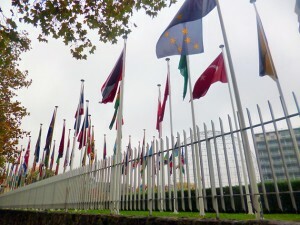 The subject of toponymy is now not only dealt within an onomastical context at the biannual ICOS meetings, and within an administrative context at the biannual UNGEGN meetings, but also within a geo-cartographic context at joint ICA-IGU meetings. The toponymical contributions to the Paris International Cartographic Conference are diverse, both geographically and thematically. Geographically, the focus is on Brazil and on Europe, with a paper on Tunis as a Mediterranean extension of Europe. The subjects range from the collection of geographical names to the operation of names servers, from the use of exonyms in school atlases to the creation of names data bases and from the reconstruction of former namescapes to the creation of new ones. We are happy to announce the Map of the Month for February: “Port de Djibouti” by the French Navy’s Hydrographic and Oceanographic Agency. It received the second jury’s prize in the category “Hydrographic or Maritime Navigation Charts” at the International Cartographic Exhibition at ICC 2011 in Paris. Zoom in and get more details here! We are happy to announce the Map of the Month for December: The digital map project “Litto 3D” by the French institutions IGN and SHOM, which received the first jury’s prize in the category “Digital Products” at the International Cartographic Exhibition at ICC 2011 in Paris. The new members of the executive committee are online. Commission reports and posters are available. The awards section was updated. 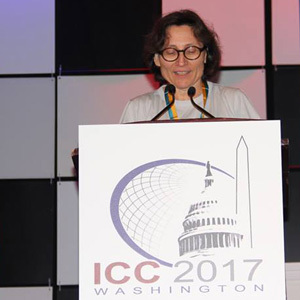 We introduced a new website section dedicated to ICC conferences. In this section we also have more details about the winners of the Barpara Petchenik Children’s World Maps Competition as well as the National Map Exhibition, see ICC 2011. And, we have a new national member: Uruguay! If you think there is some important information missing or if you find an error on the website, please don’t hesitate to contact Manuela and Felix at website@icaci.org. The last International Cartographic Conference took place in Paris, France from 3rd to 8th of July 2011. The proceedings of this event are now available online via the publications section! 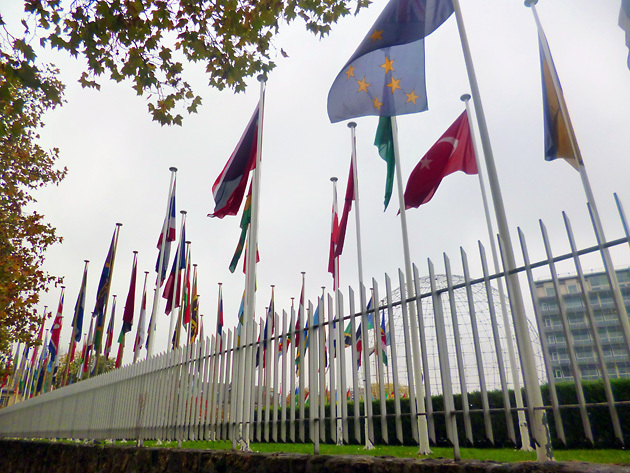 The ICC also hosted the 15th General Assembly of the ICA. The relevant changes to the ICA structure, especially the new Executive Committee of the ICA, will be reflected on the ICA website in the upcoming weeks.